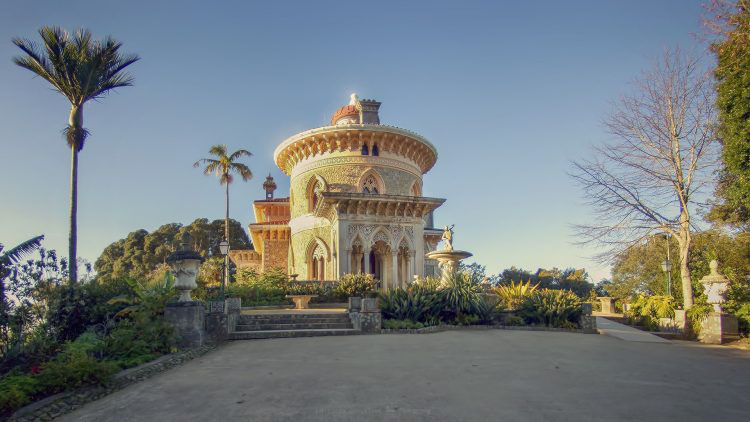 The Monserrate Palace is one of the most beautiful architectural and landscape creations of Portugal Romanticism. Sir Francis Cook, an English millionaire of the textile trade, 1st Viscount of Monserrate and owner of one of the greatest private art collections in Britain, was the creator of the garden and the Monserrate Palace, which were in the 19th century, the summer residence for Francis Cook family. From the top of the Park, imposing itself over the beautiful landscape is the Palace Monserrate. Gerard de Visme, an English merchant was responsible for the construction of the first Palace of Monserrate, and in 1856 Monserrate was fully rehabilitated, under the coordination of English architect James T. Knowles, into the summer residence of the cook family. The history really begins in 1540, where the Chapel dedicated to Our Lady of Monserrate was built where the Palace now stands, and in the forthcoming centuries it was leased to several important families, until Sir Cook buys it in 1856. The Palace is a unique example of the eclectic spirit of the XIX century, a Neo-Gothic mansion where we wonder through the gallery, a central body, which links the dining room, the library, billiards room, the Indian drawing room, finishing in the marvellous Music Room. Nowadays, receives temporary exhibitions of painters, photography and it is also available for weddings, and Casa da Capela proudly stands near this unique spot.